Emergencies caused by fires have a way of happening at the oddest times. For fires, it’s not surprising that fall and winter months see the most occurrences, with December and January being the peak months. What is surprising is that home fires tend to occur on the weekend, and between the hours of 6:00 and 7:00 PM on both Saturdays and Sundays. That’s why Paul Davis companies offer 24-hour, 7-days-per-week emergency call services. Not with a voice-prompted ‘leave a message,’ but with operators who, similar to 911 operators, are able to calmly take down vital information and arrange for emergency services. Paul Davis typically dispatches crews to a fire scene within 90 minutes of the call. To understand the gravity of home fires, the most recent home fires research from a report generated by the Canadian Centre for Justice Statistics for the Canadian Association of Fire Chiefs sadly reports these statistics regarding home structure fires. 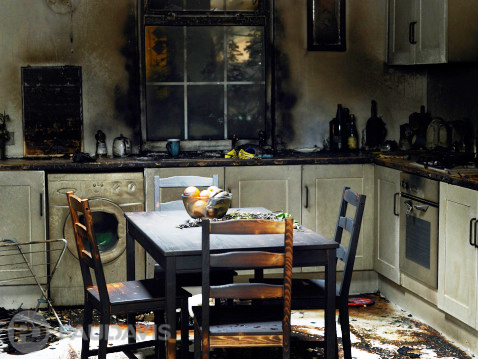 The majority of fire-related deaths occur in structural fires. For example, in 2014, 87% of the reported fire deaths occurred as a result of structural fires. Vehicle fires accounted for 11% of reported deaths, while outdoor fires accounted for 4%. There were 9 reported firefighter deaths experienced as a result of firefighting activities related to fire incidents between 2005 and 2014. Among structural residential fire incidents, cooking equipment and smoker’s equipment/open flame were the two leading sources of ignition in residential fires over the 2005 to 2014 period. Of the 19,062 structural fires reported in 2014, three quarters (74%) were residential fires. Of the deaths occurring as a result of structural fires over the 2005 to 2014 period, the majority occurred as a result of fires in the home, ranging from 87% in 2009 to 95% in 2008 and 2010. With all this destruction and related injury and death, there are positive signs of improvement. In general the total number of fires reported to the National Fire Incident Database (NFID) showed a downward trend, declining 25% between 2005 and 2014. Over the 10-year period, the database showed a total of 439,256 fire incidents, 1,733 fire-related deaths, and 12,503 persons injured.